We’re committed to offering our readers the best possible information to help everyone live and enjoy a happier and healthier life. This means that we’re always searching for the next solution for any of life’s many problems and exploring it in a way that best applies to your everyday life. Sometimes, there is content that’s perfect just the way it is. In this case, we are very lucky to be collaborating with the people behind this valuable article and have been granted permission to republish it. We encourage you to visit their website at the end of this post. Trying to go alkaline? It’s easier when you know which foods help your body stay get to and stay in an alkaline state. 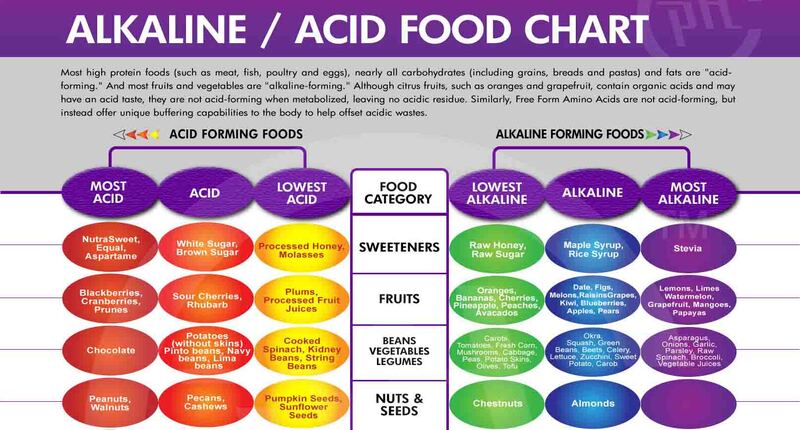 A general rule of thumb is that you can eat these foods without worrying about any acidic effect they’ll have, although some are more alkaline than others. It isn’t necessary to eat only alkaline foods in order to get body’s pH levels to be alkaline, and a certain percentage of foods can be acidic, but it’s best if they’re natural, whole foods like fruits. Almonds consistently rank on the list of healthiest foods to eat, so it’s no wonder that they’re also an alkaline food. They’ve also been linked to increased muscle gain, a lowering of cholesterol levels, and are able to assist with fat loss. You don’t have to eat a lot of almonds in order to enjoy their benefits, but they do make a great snack that you can take anywhere and can help you between meals. This is a grain that not many people are familiar with, but that makes a great addition to any alkaline-focused diet plan. In addition to being an alkaline forming food, it’s also known for its relatively high levels of protein for a grain, and it’s full of vitamins and minerals that are essential for overall health. If you’re not sure how to prepare it for you and your family, there are plenty of recipes available to bring you up to speed. Artichokes are often seen on top of salads, or used in a dip, but there are a number of reasons why you can bring them to the forefront of your diet. One of those reasons is their alkalinity, helping to raise your body’s pH levels. They’re also full of antioxidants, help to purify the liver, and aid in digestion. So having a salad with leafy greens and topped with a hearty amount of artichokes is a great idea. Asparagus has an alkaline effect on the body, and it just so happens that it’s one of the strongest foods you can eat in terms of alkalinity. Each food is ranked according to how alkaline it is, and asparagus is one of the “big dogs”. But it brings a lot more than that to the table, including antioxidants, nutrients, and plenty of detoxifying qualities. It’s even been noted that asparagus has anti-aging benefits, which is enough for most people to start adding more of it to their menu. It’s no surprise that avocado is on our list of alkaline foods. It’s managed to make it onto our list of superfoods as well, so you know it’s packing a nutritional punch. Avocados are high in potassium as well as healthy fat, so in addition to helping you be more alkaline, you’re getting other perks as well. You can also use avocado oil in favor of other oils that don’t provide any alkaline benefit, or worse are acid-forming in the body. You might not have thought that the herbs and spices you use on your food have an effect on how alkaline or acidic your pH levels are. But as it turns out there are good spices and bad spices. Basil happens to be one of the ones that helps keep you alkaline, and it also has plenty of other things going for it, such as the flavonoids it contains. These help the body to heal and basil in general can help with several different areas of the body. Beetroot gets more attention now than ever before, and it’s one of the foods out there that will act to help raise your pH levels. The reason it’s an important vegetable to include in your arsenal is because it’s one of the only sources of the phytonutrient betalain which may have anticancer properties. Add these as a side, or use them as a salad topper. Be sure to buy this one fresh and steam it, as the pickled variety has reduced nutritional value. This is a quintessential healthy food and it’s easy to understand that it’s an alkaline food. Broccoli is one of those vegetables that has so much going on you simply have to make an extra effort to get more of it into your system. Some people eat broccoli every day as a way to maintain good health and make sure they’re on the alkaline side. You at least want to eat it multiple times a week, with 3 or 4 times being a good rule of thumb. This article was republished with permission from Bembu. Click here to read the rest of the article.